Worklessness is an important public health issue at both local and national level and is highlighted in many health and wellbeing strategies, devolution plans and in the Five Year Forward View and Sustainability Transformation Plans for the NHS. With combined costs from worklessness and sickness absence amounting to over £100bn annually, greater than the annual budget of the NHS and equivalent to the GDP of Portugal, there is a strong economic case as well as a moral and ethical case for greater action. There is also a clear evidence base that shows that for the majority of people being in ‘good work’ is better for their health than being out of work. ‘Good work’ means having not only a work environment that is safe but also having a sense of security, autonomy, good line management and communication within an organisation. 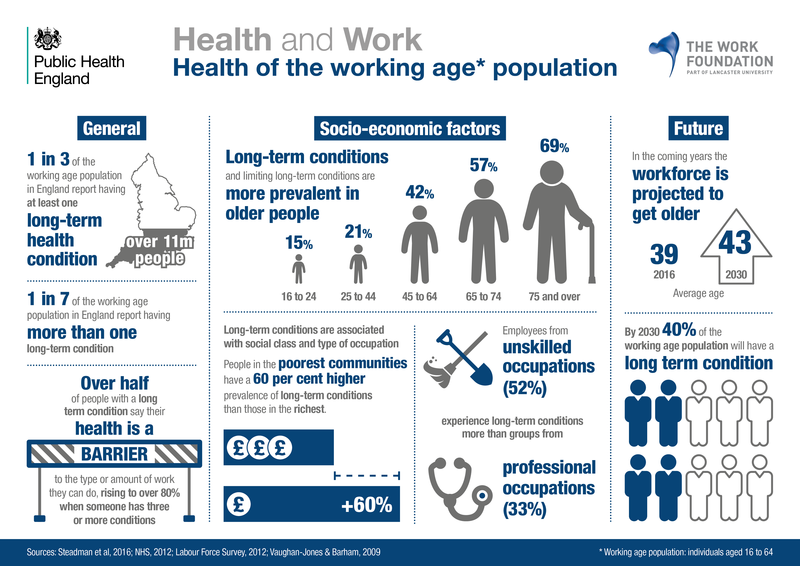 One in three employees currently have a long term health condition, one in seven report having more than one diagnosis and by 2030 it is estimated that 40% of the working age population will have a long term condition. The statistics say it all - it’s hard to avoid the fact that this is a significant issue for employers. Supporting people with long term conditions to remain in work is generally more cost effective for employers than losing the knowledge, experience and the direct and indirect costs of recruitment and replacement. Many companies will be aware of this, and will already have systems in place to help prevent health issues before they arise, such as mental health first aid training. Creating a culture where talking about health conditions is a good place for companies to start. 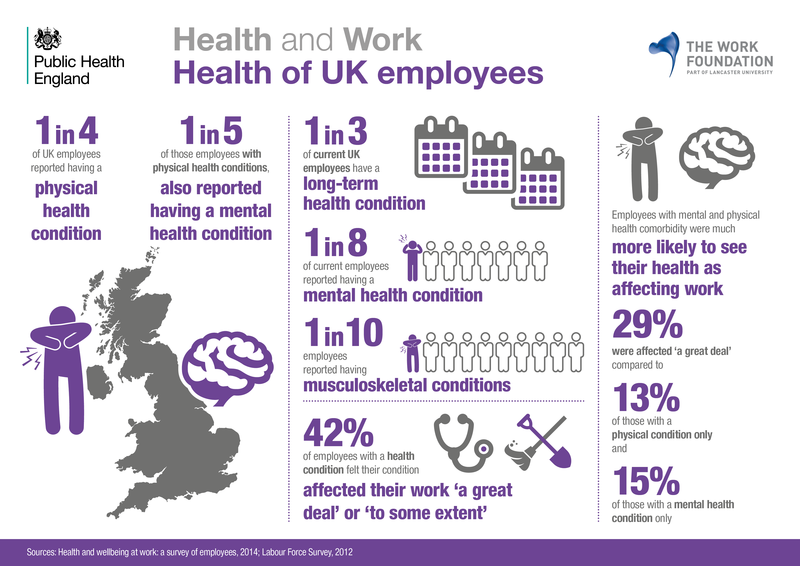 One in three employees with a long term condition will have not discussed it with their employer, and only 52% have access to occupational health support through their work. This reflects the scale of the challenge to tackle stigma around having an honest conversation about health problems. Companies need to get the right support in place for both staff and their line managers in order to maximise the potential of individuals whilst keeping them productive and engaged in work. This week we partnered with the Work Foundation to publish a suite of infographics that aim to help raise awareness and understanding of the relationship between health, work and worklessness. They are designed to illustrate the context for supporting the health of the UK workforce, as well as those who are currently workless. 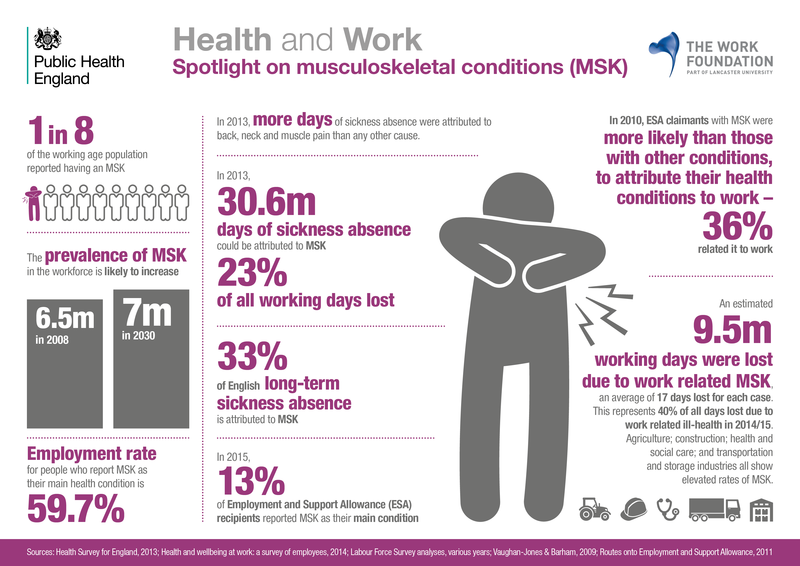 The infographics include specific sections on mental health, musculoskeletal issues and issues for younger and older workers, which are two of the main causes for sickness absence. As part of the package, there are also infographics focused on data around worklessness, highlighting different health conditions in the context of employment support allowance claims. For instance, 48% of ESA claimants have mental health and behaviour disorders and 13% have musculoskeletal issues, so there is real potential here to support people to manage their conditions and help them remain in positive and constructive employment. We hope that these resources will help local systems reflect on how they can work coherently together to support individuals with health issues remain in sustainable employment and achieve their employment potential.